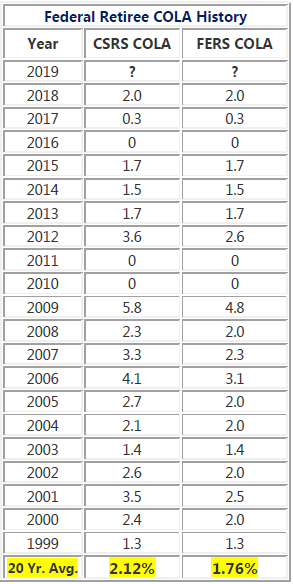 Below we have a table depicting the Federal Retiree COLA history from 1999 through 2018. Cost of Living increases are measured by the Consumer Price Index for Urban Wage Earners and Clerical Workers (CPI-W). Social Security and Supplemental Security Income (SSI) benefits are adjusted to reflect any increase in the cost of living. The cost-of-living adjustment protects the purchasing power of Social Security and SSI benefits. How is the CSRS COLA and FERS COLA determined? • If the CSRS COLA is more than 2% but less than 3%, then the FERS COLA is 2%. • If the CSRS COLA is less than 2%, then the FERS COLA is the same. This content is for information purposes only. The views and opinions expressed here are of the author and do not necessarily reflect the opinion of Spire Wealth Management, LLC. Spire Wealth Management is a Federal Registered Investment Advisor. Blueprint Financial Group is an independent firm.